The 48-year-old American actress with 1.68 meters height was born on December 8, 1964 in Palo Alto of California. 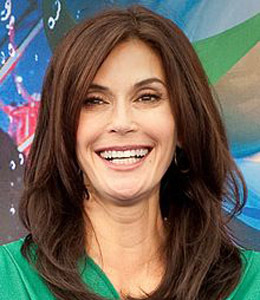 Teri Lynn Hatcher is an actress, writer, presenter, and former NFL cheerleader. She is known for her television roles as Susan Mayer on the ABC comedy-drama series Desperate Housewives, and Lois Lane on the ABC comedy-drama series Lois & Clark: The New Adventures of Superman. Her father is a nuclear physicist and her mother is a computer programmer. Her father is of Welsh descent and mother is of half Syrian and half German-Irish ancestry. She and attended the Mango Junior High, Fremont High School in Sunnyvale and De Anza College in Cupertino and studied mathematics and engineering in undergraduate. Hatcher studied acting at the American Conservatory Theater. She claims that she was sexually molested by her then-uncle, Richard Hayes Stone, from age 5 to 9. Stone died of colon cancer on August 19, 2008. The famous actress has married to Jon Tenney and Marchus Leithold. She married Marcus Leithold on June 4, 1988 and divorced the following year. Similarly, On May 27, 1994, she married to actor Jon Tenney; they had a daughter, Emerson, on November 10, 1997, and divorced in March 2003. She was also a columnist for in Glamour. Her inspirational autobiography, "Burnt Toast: And Other Philosophies of Life", was released in hardcover by publisher Hyperion on May 2, 2006. The audio CD version of the book narrated by Teri Hatcher was released on the same date. The book deals with a woman's struggle of to juggle life through good times and bad. For her, natural brunette hair, voluptuous figure, lisp and breathless voice are her trade mark. It is said that she received 75,000 US dollars per episode in 1993 from “Lois and Clark: The New Adventures of Superman”, 70,000 US dollars per episode in 2004 from season 1 of “Desperate Housewives” and 285,000 per episode from Season 2 of the same. Beginning her career in TV series and filmography during mid 80s, the famous actress has performed her role in more than 50 TV series and movies and won at least five major awards including Best Actress in a Television Series, Musical or Comedy. She was nominated for more than 10 awards in different times. During her early days of career in September 1985 to May 1986 she joined the cast of the TV series The Love Boat, playing the role of "Amy", one of the "Mermaid" showgirls. From 1986 to 1989, she appeared in the recurring role of "Penny Parker" opposite Richard Dean Anderson's eponymous hero on the TV series MacGyver. In 1987, she played the daughter of Patty Duke's lead character in the short lived Fox comedy. In 1988, she made a guest appearance in Star Trek: The Next Generation as Lt. Robinson while in 1989, she guest-starred in an episode of Quantum Leap titled "Star Crossed". Hatcher's next TV series role, in 1991, was in the Norman Lear creation Sunday Dinner, in 1992, Hatcher tried out for the role of Jamie Buchman on Mad About You, Hatcher landed a starring role of Daily Planet reporter Lois Lane (opposite Dean Cain) in Lois & Clark: The New Adventures of Superman from 1993 to 1997. On April 9, 2008, Hatcher appeared on Idol Gives Back, singing Carrie Underwood's "Before He Cheats".